The first time I rode up to Dutch Springs and got a glimpse of a Mark V diver being dressed for a dive, I amped up like a wind-up toy getting ready to launch. I was thrilled by the visual candy of dozens of hard hats that you could try, touch, and photograph. They inspired the cover to my exhibit in 2013, the cover of my book, Immerse Yourself, and an 8'x6' oil painting. Since that first experience, I've returned three more times and plan to return again next Labor Day. 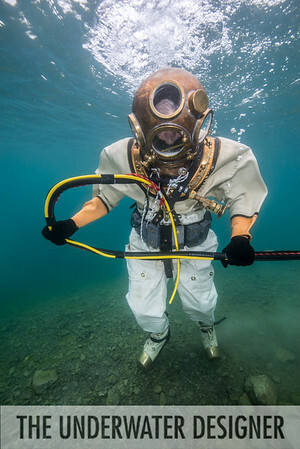 I grew to know the people in this organization that organizes Hard Hat Rallies each Labor Day and Memorial Day, the Northeast Diving Equipment Group (NEDEG). Their mission is to "share the history, respect, and excitement of historical diving." They succeed in this in every way. 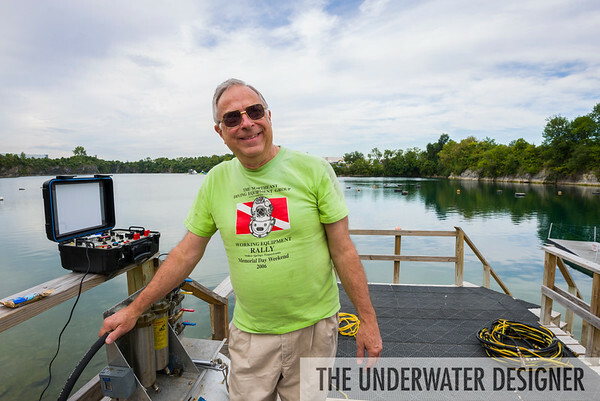 Begun in 1987 with David Sutton, history was revived as he taught divers how to use the equipment. Three of his students, Fred Barthes, John Melnick and Jim Boyd, continued to share the equipment through educational events and hard hat rallies. Though Jim Boyd passed away in 2010, his legacy continues through the NEDEG activities. Fred Barthes loves sharing and educating anyone eager to learn. He knows how the equipment functions, how to repair it, and the story of each piece. Fred presents to a number of groups, including the YMCA, the New Jersey Maritime Museum, and boy scout troops. Just ask him about one of his presentations, and he'll tell you a story of people he's met along the way and how they experienced the equipment. It's truly amazing to see how equipment can transform people. I came to photograph gear only found in museums, and found a wonderful group of friends who are generous with their time and equipment. Each trip is filled with new adventure, the last one culminating in seeing the extraordinary Russian Military Suit. I never know what's going to come out of a box. The Northeast Diving Equipment Group provides an historic experience at Dutch Springs in Bethlehem, Pennsylvania.